On Sunday, in a radical departure for Irish politics, the Mr Adams announced his decision to put his name forward for the Sinn Fein nomination for the Louth constituency at the next 26-County General Election. Mr Adams is currently a member of the Westminster parliament in London and also a member of the Six-County Assembly at Stormont. This week he will quit the Stormont Assembly and also plans to resign his West Belfast seat at Westminster in favour of a new political role in the Dublin parliament. Mr Adams made the announcement on Sunday at the commemoration of the Edentubber martyrs in County Louth. “Ireland is at a crossroads,” he said, addressing the 53rd anniversary commemoration of five IRA men killed by their own bomb on the Border in 1957. “This state is in the midst of a deep economic and social crisis. This Government is probably the most unpopular in the history of the state. It is now implementing bad, deeply damaging policies. It has no mandate whatsoever for this. “There is a better way. Together we can rebuild Ireland. “People need to make a stand against what is happening. We need a better way forward for our country and its people. “All this imposes a huge responsibility on those of us in positions of political leadership. In the past I have asked people to step forward and to show leadership. Last week, it was revealed Mr Adams’s party colleague Arthur Morgan will not seek re-election to his seat in the border constituency. A 26-County general election is likely to be held by the Spring, when the governing Fianna Fail/Green Party faces the almost certain loss of its working parliamentary majority in three by-elections. Mr Adams’s nomination is likely to be confirmed when the party organisation in Louth meets to select a candidate. He linked his candidacy to opposition to current economic policy. “As the leader of Sinn Fein, in this time of crisis in our country, I am making a stand with this initiative - a stand for a better, fairer, united Ireland. I believe that things can be turned around. There is a better way,” he said. Mr Adams said his move was a measure of Sinn Fein’s determination to provide a “real alternative to the consensus for cuts being pushed by other parties”. Sinn Fein secured 15 per cent of the first preference vote at the last general election, with Mr Morgan taking the final seat in the five-seat constituency. Commenting on the announcement, Deputy First Minister Martin McGuinness said: the decision to leave one of the safest seats in Ireland play a central role in the battle for Ireland’s economic recovery was “leadership in action”. 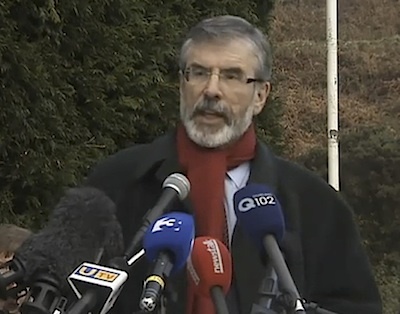 “It is the sort of leadership this country needs at this time in our history. I have obviously spoken with Gerry about this decision and in my view people across Ireland will welcome this bold initiative.